Morello is a traditional English cooking cherry - if you want to make cherry pies, cherry crumbles, or jams and preserves, this is the best cherry variety to choose - when cooked it has a strong rich cherry flavour. Morello cherries can be eaten fresh when very ripe (at which point they have a sharp-sweet flavour), but Morello belongs to the acid-cherry or sour-cherry (Prunus cerasus) species rather than the sweet-cherry species (Prunus avium), and is grown primarily for use in the kitchen. The fruits are smaller than modern dessert cherries, looking more like small seedless grapes. Morello cherries (like most sour cherries) contain melatonin, a natural anti-oxidant substance which is also involved in regulating sleeping and wakefullness. Morello is also an excellent pollinator of most other cherry varieties. 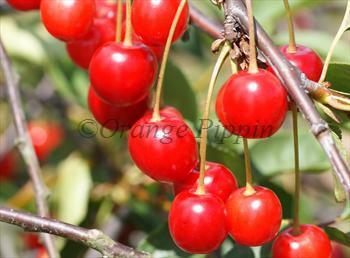 Please fill in the details below and we will let you know when Morello cherry trees are back in stock. Flowers over a long period? Use / keeping: Does not keep? Morello is in flowering group 4. Morello is self-fertile and does not need a pollination partner, although fruiting may be improved if there is a compatible tree of a different variety nearby. Whilst sweet cherries really need a sunny aspect, acid-cherries are far less demanding. Morello can be grown on a north-facing wall if necessary, and is hardy and reliable. It is self-fertile, and the blossom is relatively late, so the risk of frost-damage is slight. Acid cherries arguably produce better-looking trees than sweet cherries too. If you need to prune, do so in spring to reduce the risk of bacterial canker, and note that Morello fruits mainly on new shoots which grew the previous summer. However as with all cherries and plums, it is best to avoid pruning if you can. The blossom of Morello cherry is particularly long-lasting and compatible, making it an excellent pollinator of most other cherries (sweet or sour). Morello cherries have been grown in the UK since the early 17th century, but the origins of this variety are unknown.